About 'Free Christian Illustrations' & Us. ‘Free Christian Illustrations’ is a non-denominational website created by a husband and wife team, Ian & Sue Coate. 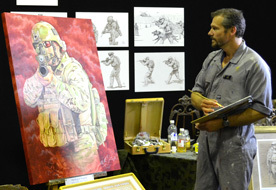 They have used their artist ability and computer skills to freely pass on the biblical truths that they in turn have freely learnt. Anyone who desires these Christian Illustrations can use them without cost or obligation. In the sentiment of Matthew 10:8, freely we have received, freely we give. Sue Coate enlisted in the Australian army in the mid 80's. She changed from the Royal Australian Corps of Transport to the Royal Australian Signals Corps. Sue served 17 years in the army attaining the rank of Sergeant. 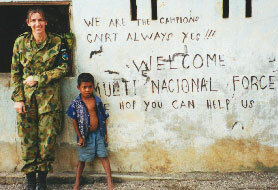 She served a 7 month tour in Timor as part of INTERFET in 1999, before leaving the military in 2001. Sue is now a Senior Systems Engineer. She keeps herself very fit by competing in the Masters Athletics. 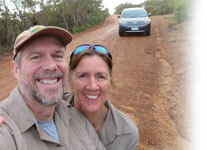 Ian & Sue’s three children have all grown up and become soldiers, nurses and teachers. For Christian Ministries Links that have been extremely helpful in our spiritual growth - PRESS HERE. If there has been a long delay in us replying to you, we are probably lost somewhere in the Australian bush and we'll reply as soon as we are found. We certainly appreciate your emails informing us how our small ministry has helped your ministry. These emails encourage us to keep uploading free content. No one is more amazed than us how our little ministry is being utilized worldwide. Below are some email excerpts and photos we have received letting us know the clever ways our illustrations are being used. Thank you so much for taking the time to contact us. CHINA: I'm in HangZhou china. And I'm prepare my sunday school class. I want to thank you for your web and pictures, because I can use these in my class, and these pictures are really useful, helpful and so nice. God bless you, thank you again. PHILIPPINES: I am Shiela, 29 years old and l am from the Philippines. I really want to thank our LORD JESUS CHRIST for this free Christian illustration site and to you all. I always enter and leave the site blessed. WASHINGTON: My name is Byron and I am a Christian teacher and principal at a small private school in the state of Washington, United States. I found your wonderful site about three months ago. I have been using the Bible clip art for a Bible game for my students in grades 3-8. It has been a great way for them to learn the Bible and to know Jesus better. They love all the interesting faces and characterizations! I appreciate all you are doing with this. I check often for new clip art images to use in our game at school. I am looking forward to more Bible characters. Keep up the good work! BOLIVIA: Hello from Santa Cruz, Bolivia! I just wanted to write and thank you for providing your materials for free. I have worked in Bolivia 28 years (in November) and I have spent many, many hours looking for and using graphics to illustrate my lessons (I am not artistic in the slightest). Almost all websites, with half-decent graphics, charge for them - and sometimes quite a bit. Your graphics are top-notch and so I was very impressed, not only by the quality, but by the fact that you offer them for free. Anyway, a great big THANK YOU all the way from South America. Carolyn. USA: I just wanted to say that your labor is definitely not in vain! Thank you so much for having this website. I am a home school mom and a children's bible study teacher and it not always easy to have free resources. God Bless your family and ministry. Glory to God, and happy thanksgiving. MUMBAI: Greetings to you in the matchless name of our Lord and Saviour Jesus Christ. I am from Mumbai, India… From the bottom of my heart, I want to thank both of you - Ian and Sue. I couldn't help but somehow search for your email so that I can tell you personally how grateful I am (and we are!) for what you do. Not just because we are taking a few of your illustrations, but because of the heart that God has given you! It encourages me to do the same. Needless to say, I am absolutely a fan of your illustrations, but more than that, a fan of your heart. Thank you so much once again! Blessen. BRAZIL: My name's Andesson. I'm Brazilian and I'm 21 years old. I'm a Protestant Christian and loved your website illustrations… God bless your family and your beautiful work . Know that through small gestures many lives can be transformed , and through these illustrations, many hearts are being filled by good things . Once again : Thank you, God bless you! Obrigado, amigos em Jesus! INDONESIA: My name is Ratna, at first I need to thanks to Jesus for you two who let us to use your illustrations for free. Thanks for the ebook, biblecard, and the bibleclipart, thats very helpful for me and my team, specially for my sunday school students. Yup, i am a Sunday school teacher at Malang city, Jawa Timur, Indonesia. I hope, i can receive weekly illustration email from you, to enrich my material lessons and make my students love to learn about bible more and more with your illustration. Jesus bless you and your family always, more than you be blessing for me and my students through your creation. SOUTH AFRICA: I am Robert from Cape Town in SA and just want to say thanks a lot for this excellent site you two have and it is really inspiring to read through. Thanks again and have a wonderful day. God bless. MALAYSIA: My name is Jenny. I am from Malaysia. I thank God for leading me to your website. I am currently a volunteer teacher to the Myanmar refugees in Malaysia. There are 70 Myanmar refugee schools registered with UNHCR here. The school that I teach in has 150 kids aged between 6 to 18. I teach the older children who understand English and they are in Year 6 and Form 1. And I also teach once in a while in a care group of my church. Recently I discover your website as I was searching for some stories and illustration to help me teach better. PHILIPPINES: Greetings from the Philippines. I'd like to commend your work in spreading the good news of our Lord Jesus Christ through your website and your generosity in freely giving as we Christians have freely received… I truly enjoyed your website and felt uplifted by your work of love in Jesus' name. Your brother in Christ, Steve . I came across your website this week and just wanted to let you know how blessed I was to see all that was available for me to use. I teach the preschool class at my church. I love that age; they are like sponges and I am really surprised how much they do learn. Thank you soooo much for your giving and open heart to make my teaching a whole lot easier and colorful. God bless you and looking forward to seeing more of your work and illustrations. In His Service, Pat. I just discovered your website and wanted to thank you for sharing your gifts so generously. The analogies and illustrations are not only creative, eye-catching, and easy to understand, but they are solidly biblical and grounded in the Word and its truths. I don’t usually send emails of this nature, but I’m just very impressed by the content and touched by your heart to share it freely. Thank you! Helina. I just wanted to say thanks for the free Christian illustrations. I'm a catholic priest and I love to draw illustrations as well, so I'm hoping to look at your work for inspiration. I'm impressed by your way of teaching through these illustrations and I'm interested in doing the same for the Catholic faith. Rev.Addisalem. I was just perusing through the internet to find some illustrated art with which to teach Children. I came across your wonderful work. I just want to say I am deeply moved by your love for the lord. May your wells never dry up in Jesus name. SD Abraham. I am Ptr. Daniel … a baptist church preacher… I was so blessed that I've found your site and read some of your write-ups with funny pictures. I downloaded it and saved it to my usb… I was encouraged by your dedication to freely give and share your talents for God's glory. Praise God for that, I actually prayed for your family when I read your simple testimony and saw your pictures with ma'm Sue. May God continue to use your life and talents for God's glory and be a help to some ordinary pastors like me. I just want to say I just discovered your site and asked myself why haven't I discovered this before. It's hard not to instantly become a fan of your apologetics-related material, what with the lively illustrations and sound arguments—I will definitely be using them for my small group, which is for some reason consisted of thinkers, one being even agnostic. That said, your free stuff are such HUGE blessings to me. I am pretty sure that with this tool, my group and I will grow deeper in our relationship with and knowledge of God. James. I want to thank you for the great clip art at your website. I direct a children's program at our church and we are teaching the children about Redemptive history. I used your clip art to make a visual so that they can see human history as it is taught in scripture... This was a huge help in keeping the children engaged. Thank you. Coralie. God bless you guys for following his leading to put up this website. I just felt the Holy Spirit lead me to go to christian illustrations on google, and I found what you guys put up. May God increase you and take you to the next level. I see people receiving healings in various aspects of their lives through this ministry. God himself will broadcast you. In Jesus name. Thanks for being a blessing. Odunjo. Thank your for your "freely received, freely give" policy as well - a rare attitude in the Christian scene today. I work on the same basis for my resources in French. May God continue to bless you as you serve Him in this way. Denise. I just wanted to thank you for offering your illustrations to use for free. I was looking for something like this for our Lutheran Preschool Fun Fair to use for our Christian based games and when I came across your site I knew I hit the jackpot! I will be using your art and other resources from your site for many of our church activities. Hillary. It is difficult to find good Christian art that is free to use. I write the weekly church bulletin and I find that “a picture is worth a thousand words” especially with the very young and the elderly who may not have the attention span or energy to read all the words… God bless you and thanks so much. Linda. Thank you to the many people who have sat through a session of me reading Illustrations at them. Special thanks to my Mum & Dad, John & Eileen Mennen and David Webb who have given graciously of their time to edit these Illustrations, and to Alan and Caroline Garstone, Geoff and Sabine Badart, Peter and Zoe Berringer, & Murray Bell, whose support and insightful comments have enabled these Illustrations and web site to come to fruition. We would further acknowledge and thank Berachah Church, Faith Bible Church, Cross Road Bible Church, Grace Resources and Basic Training Bible Ministries, their faithful teaching and free distribution of God's Word has enabled us to grow in Grace - even in some of the remotest regions in Australia. PRESS HERE for links to websites that have excellent Christian resources.